It’s no secret I am coping with summer by having the boys in every variety of camp. They’ve already been in soccer, basketball and a full-day camp (my personal fave). This week they’ve headed off to an afternoon Lego camp. Generally speaking, T.Puzzle has a much more laid-back attitude about camps and life overall. He’s happy wherever he goes and maintains it. Full Speed, he’s a little slower to warm up to new camps and ideas. Out of all the camps, the full day one was the toughest sell for Full Speed. I’m guessing because they did things that weren’t competitive that it really started to irk him. He sees no value in singing silly songs or crafting because at the end of it no one ‘wins’. That’s why when Full Speed won Camper of the Day I was extremely pleased. Somehow I know for him achieving this accolade made the entire week-long experience worthwhile. 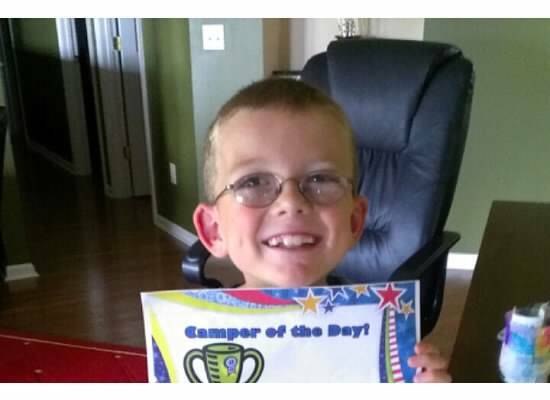 Full Speed shows off his Camper of the Day certificate. As for T.Puzzle? He honestly was happy throughout the whole entire thing. Crafting? Loved it. Singing songs? He could do it all day long and then some. Swimming? He is a complete fish in the water. However, after Full Speed won his Camper of the Day award, I could tell that T.Puzzle was kind of wistful for one of his own. 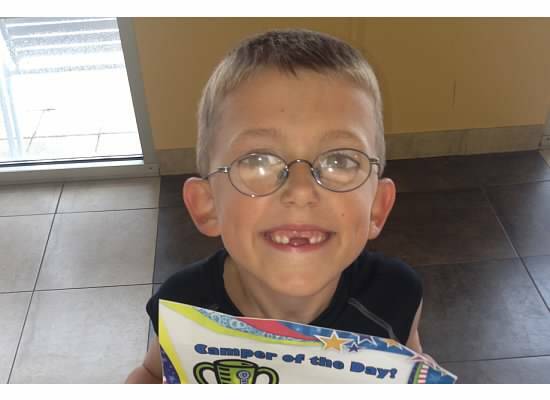 It must have been his great attitude or his awesome dimples because he pulled out Camper of the Day on their very last day. Who needs perfect behavior when you are this darn cute?